Hi! A brief introduction to newcomers to this feature… This Friday Fragment is a list of what I’ve read over the past week. It is not meant to be a recommendation list. If you’re interested in a not-at-all-inclusive list, you can look on my website. Got A Revolution: The Turbulent Flight of Jefferson Airplane by Jeff Tamarkin. Very well-written. An ambitious effort to look at the interactions of a wildly creative group of people over the course of several decades of interaction. First half of Days of Blood And Starlight by Laini Taylor. Audiobook. Border Ambush by Melody Groves. Light Thickens. Ngaio Marsh. Audiobook. Scream for Jeeves: A Parody by P.H. Cannon. P.G. Wodehouse meets H.P. Lovecraft. The author put a lot of work into fitting his stories into the established Wodehouse storyline so, for example, we now know the source of the mysterious flu that derailed one of Bertie’s engagements. Recommended only for those familiar with the works of both authors. Last week I did my best to give an answer to that perennial question: “Where do you get your ideas?” At that point, I was still seeing if the idea would become a story and I promised to give you folks an honest report. Well, I’m happy to say that the process was a productive one. As you may recall, I actively wrote right up until Friday evening. Then I decided to use the weekend to think my way through a few elements that hadn’t quite jelled. Now, some of you may be thinking that this is in violation of my claim not to outline. It isn’t. I was musing, not outlining. 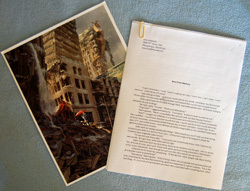 Anyhow, the picture I chose to write my story around was the first place winner, “Apocalypse Book” by Hugh Edby. A lot of the musing I did over that intervening weekend involved going over the picture with the mental equivalent of a magnifying glass, seeking small details that I might work into the story. When I settled down to write again, the story moved along quite briskly for several pages, then I found myself slowing down. Shutting off my computer, I wandered off and started reading about the various members of the first version of the psychedelic rock group, Jefferson Airplane. I learned a long time ago that trying to force a story is about as useful as banging my head against a wall and just about as painful. (See WW 8-11-10, “Walking Away From It” if you’d like a bit more about this.) What I have found is that if I distract myself – by reading or doing routine chores – often I come up with an answer. I’ll leave it there. No spoilers. I’ll be sure to let you know when the story – its working title is “Born From Memory” – is available. Now what next? Well, Wanderings on Writing needs a final go-over, then it’s off to be converted into an e-book. When that’s done? I have a few plans… Now, however, the garden produce is taking over my countertops. Time to go fuss with it. Doubtlessly while I do so, I’ll be thinking about stories. I’m curious… What do you other creative people do between projects to recharge? How do you court inspiration when you’re just a little stuck? This is also also not a book review column. It’s just a list with, maybe, a few opinions tossed in. An Aria of Omens by Patrice Greenwood. This third in her “Wisteria Tearoom Mysteries” might be the strongest. I enjoyed the use of the Santa Fe Opera as a setting. As a bonus, two original recipes – one for a cocktail, one for a dessert, are included. I want an Aria Cake now! Corto Maltese: The Ballad of the Salt Sea by Hugo Pratt. Many years ago, Roger Zelazny turned me on to the Corto Maltese graphic novels. They’re weird and wonderful, managing to seamlessly blend hard historical realities and mystic adventure. I always thought there was a story pre-dating the collections Roger sent me, even though the first one in the set (The Brazilian Eagle) was neatly labeled “1.” Imagine my delight and surprise when, while searching the shelves at my public library for something else entirely, I came across this. In some ways this volume is not as strong as some of the later stories, either in art or plot, but it’s still a great adventure tale. Recast by Seung Hui Kye. This Korean manga starts out seeming a little too much like those shonen (boy’s) manga that are thinly disguised adaptations of video games. However, I was interested enough by the end of the first three volumes to order the remaining three that our library has in stock. Lean Mean Thirteen by Janet Evanovich. Audiobook. Twelve Sharp by Janet Evanovich. Audiobook. This may be one of the best in that Stephanie Plum puts herself on the line for Ranger, rather than waiting for him to pull her out of trouble. A nice bit of character development. Got A Revolution: The Turbulent Flight of Jefferson Airplane by Jeff Tamarkin. Jim and I recently watched a documentary. I decided I wanted to learn a little more. Days of Blood And Starlight by Laini Taylor. Audiobook. I listened to the first book in the series, Daughter of Smoke and Bone, a couple months ago. And, as mentioned above, the final two volumes of Corto Maltese. Bless Me, Ultima by Rudolfo Anaya. Whenever Southwestern Spanish literature is mentioned, this book is sure to come up. I found it very slow to get started, as if the author felt he needed to anchor the eventual mystical material very solidly in little boy snot and piss. However, by the time I was finished, I was glad I’d taken the time to read it. Looking for the Wednesday Wandering? Just page back one for an excursion into the mysterious realm of Ideas. Then join me and Alan as we discuss a historical occurrence that, if it weren’t true, no one would ever believe. And remember, tomorrow, the Friday Fragments continue the fun. ALAN: Last time you promised to tell me about the Pueblo Revolt of 1680. JANE: Right! Here goes… The story begins in 1675, when fourteen Spaniards, several of whom were friars, died in the village of Powhogeh, which was called San Ildefonso by the Spanish. The deaths were blamed on witchcraft and forty-seven men were arrested, tried, and punished. Maybe the Spanish really believed that witchcraft had been used. I’ve read translations of some of the trial records and it’s impossible to tell. Remember, this was a time when witch hunts were rampant in Spain. Whatever he believed, Governor Juan de Treviño unwittingly set in motion events that would lead to the revolt five years later. You see, the forty-seven men arrested were not all from Powhogeh. They were not even all from Tewa-speaking villages. 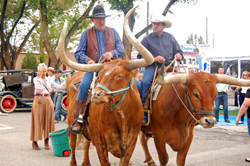 (Tewa is one of the five main languages spoken in the region.) Among those arrested were Tiwa and Keresan speakers, from groups that were, at best, uneasy allies with the people of Powhogeh. Four of these men – quite possibly strangers to each other and so unlikely collaborators – were sentenced to be hanged as examples. (One robbed the hangman by committing suicide.) The remainder were sentenced to be whipped and otherwise humiliated. What the men did have in common were that all were important members of their communities. One theory is that Francisco Guitar, who had served as guide and interpreter for the Spanish sent to investigate the deaths, decided to get even with his fellow Tewa, who now shunned him as a collaborator with their oppressors. For good measure, Guitar had pointed out a few other important men. And so the stage was set. Sorry! I interrupted. Just ignore me. There seems little doubt that Governor Treviño would have carried out his intended punishment, but a very large delegation from the local tribes, led by a man named Saca from Teotho (called Taos by the Spanish) intervened. The record says that Saca and his delegation brought gifts, but also that they made clear they would have fought if those gifts had not been accepted and the captives freed. Among those arrested and publically whipped was Po’pay, a priest and leader among the people of Ohkay (called by the Spanish, San Juan Pueblo). Because of the Spanish’s proclivity for recordkeeping, we know a lot about the events of 1675. What exactly happened next is more open to speculation because – obviously – the Spanish didn’t know the details of the revolt being planned against them. However, Po’pay – working with Saca and others – managed to coordinate a revolt that would remove the Spanish from New Mexico for the next twelve years. The feat boggles the mind. Do me a favor and pull out map of New Mexico so you have some idea of how large the area we’re talking about is. Got it? Phew! (Geographically challenged Alan relaxes). Did I ever tell you about the time I really did get lost walking from the bedroom to the bathroom? It’s a true, and very embarrassing, story. Perhaps that’s a tangent best not explored. Tell me about New Mexico instead. JANE: Hmm… I may ask for that story off-stage. (I did. Oh, my!) But back to New Mexico. Now, remember, New Mexico isn’t a green and pleasant land. It’s dry and rocky, with temperatures that go well above 100 degrees Fahrenheit in the summer and well below freezing in the winter. There’s no hopping a boat for easy travel between points. At the time Po’pay and his allies were planning their rebellion, the horses were largely owned by the enemy and those who collaborated with them – so travel would have been on foot. Despite this, Po’pay coordinated a revolt that – if one put it in a novel – the critics would be screaming about the unrealistic nature of the details. Just a few include forging a successful alliance between peoples who spoke five different languages and had different cultures (and that includes religious beliefs), the use of a knotted cord to synchronize attacks so that the uprisings happened simultaneously across the region, and the defeat of armored men armed with higher tech weapons (muskets, swords), by unarmored warriors with clubs and short bows. ALAN: I could make a facetious comment, but that is so awe-inspiring that I wouldn’t dare cheapen it by doing so. It really beggars belief and I am truly astonished and amazed. Real life trumps fiction every time. But sometimes real life is hard to believe. JANE: It gets better! There are some other details right out of a science fiction novel. Po’pay was said to have mysterious advisors, whose names do not fit into any of the language groups spoken in the area. Even better, he was said to have been able to shoot lightning from his fingertips and feet. I used these details and others in my short story, “Like the Rain” (published in Golden Reflections edited by Joan Saberhagen and Robert Vardeman). However, this was one of those cases where the inclusion of futuristic high tech intervention actually made more sense than leaving it out. ALAN: Now that I’ve willingly suspended my disbelief, tell me what happened afterwards. JANE: The Spanish were kept out of New Mexico for twelve years. Later, they claimed a “bloodless” re-conquest, aided by the intervention of the Virgin Mary who performed miracles, including aiding the Spanish in getting their heavy wagons up La Bajada hill. This would indeed have been a tremendous help to an invading force. Even today, with a modern highway, large vehicles pull to a special slow lane to labor up La Bajada. The Spanish with their ox carts would have been very vulnerable. The wooden image of the Virgin, now called “La Conquistadora,” remains enshrined in Santa Fe and is paraded through the streets during the annual Fiesta. However, although the re-conquest was far from the bloodless victory the Spanish claimed, it was not as devastating as it might have been, either for the Spanish or for the native peoples. 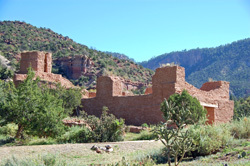 Most historians agree that the native peoples could not agree how to live once the Spanish were gone. Some purists – Po’pay among them – wanted to eliminate anything the Spanish had brought with them. Others had grown to like melons, sheep, and other introduced items. Christian saints and customs had been absorbed into the local religions. With all the disagreement among themselves, the Pueblos may have been resigned to the return of the Spanish. ALAN: Much like the Maori who enthusiastically adopted Christianity, and alcohol and firearms and potatoes and warm clothes and who have no desire at all to go back to the old days – though Maori pride in their history and heritage is a very real phenomenon and they certainly do try hard to keep the old traditions alive. Nevertheless, they are also very much twenty-first century citizens. JANE: Based on the Comments these last several weeks, there’s lots of interest in the impact on colonialism on the cultures of the indigenous people of both New Zealand and New Mexico. Maybe we can take a look at that next time! First… For those of you who missed it, I’ve started a new feature on this site: the Friday Fragments. I intend this to be a weekly list of what I read or am reading, perhaps with some commentary. Hope you’ll take a look at it. Inspiration comes in odd packages. Every writer knows this, but this week I had a really vivid example this week that I want to share. If there’s a question that writers hear more than any other, it’s “Where do you get your ideas?” I’ve heard answers both flippant and serious – including a simply wonderful one in the short essay Darynda Jones included in her talk for the Jack Williamson Lectureship, which I encountered reprinted in the Bubonicon program book. The piece was set up as a mock question and answer session. In case you aren’t familiar with her work and don’t realize that she’s very funny, Darynda meant this humorously. However, it is amazing how many readers do think a writer has done everything that happens in their books – or if not done it, at least daydreamed about it. I guess it’s the influence of that old “write what you know” thing, combined with English teachers who insist on teaching fiction as if it’s nothing more than thinly veiled autobiography. 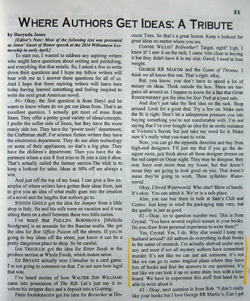 But I’ve promised you my own latest “Where I got my idea…” anecdote. It’s not as funny, but it’s for real. This past weekend, Jim went out of town to visit his parents. For various reasons, I had to stay home. And, no, none of these reasons include not liking my in-laws. I do. A lot. So as the week went on, I felt sadder and sadder, contemplating that Friday morning would see me driving Jim to the airport, then watching him walk off through Security without me. I comforted myself with the idea that he’d be home quickly. In fact, Sunday mid-afternoon would see me at the same place, waiting eagerly to catch a glimpse of him coming up through the walkway. When I had finished my manuscript for the forthcoming non-fiction Wanderings on Writing, I’d switched over to seeing if I could come up with an idea to fulfill one of the projects to which I’d promised a short story. I’d done a lot of scattered reading and brainstorming, but nothing had jelled. Now this had come, answer to a prayer. I was too beat to get up, but I grabbed a piece of paper from the notepad next to the phone and scribbled a few lines. These weren’t because I was worried I’d forget – the idea was now solidly rooted in my imagination – but to give my mind permission to let go so I could get some sleep. The next day, despite noisy construction right outside the office window – we’ve finally had the sunporch roof repaired! – I started writing. The first day I managed about five pages. The next day, I took these basics and loosened them up, adding more dialogue and getting rid of the summary. I only added another page or so, but now I could see the story’s shape. Aside: Recently, I was re-reading a few of my older never-sold stories. Partly, I was looking to see if there was anything I could use, partly I was looking to see if – given all the attention I’d just put into Wanderings on Writing – I might have an insight into why these stories hadn’t “worked.” As I read through these efforts, many of them more than twenty years old, I realized that in many cases these pieces never went beyond the “Idea” and became a full-blown Story. It was as if I had sprouted seeds but never put them into the right sort of containers or given them the right care to enable them to flourish. Often they had a good central character or interesting setting, but not enough plot. But whether or not the story works, I had that golden moment where an Idea came and took root. Would it have done so if I hadn’t already been receptive? Possibly. Like most writers, I have a list of ideas that I hope will someday fit into a story. However, in this case, I think there was synergy between my mental state and the parameters for the short story I needed to write. How about you? Where do you get your ideas? I know that in addition to writers, we have visual artists and songwriters who occasionally weigh in. Is the process different with different arts? Or is it similar and merely takes a different shape in the end? Welcome to the Friday Fragments, a new and possibly continuing feature on this site. I expect I looked blank. For a moment, I thought she might be asking me if I could read, but that didn’t make any sense. Then I thought she might be asking if I was willing to continue or repeat the reading from Artemis Invaded I’d given on the previous Friday afternoon. This took us off into a lively discussion. 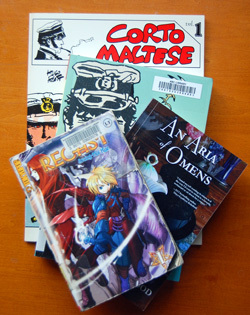 It also made me decide that it might be fun to share every week what I was reading. This list is not to be taken as recommendations. If you want recommendations, you can find a not-at-all-inclusive list on my website. If I’m in the middle of a book, I’ll list that, since sometimes, especially with a very long novel, the reading may spread out over several weeks. Unless I spend a lot of time on them, I’m going to skip magazines and short articles. For the first few weeks, I’m going to include a few titles from previous weeks, just because. Abadon’s Gate by James S.A. Corey. This is the third of their (the author’s name is a pen name for Daniel Abraham and Ty Franke) “Expanse” novels. Keeps the close focus on characters that won me over to the series. This one got dark enough that I couldn’t read it before bed, so it took me a while to finish. Black Butler by Yana Toboso, issues 12 and 13. I’ve been reading this manga for some weeks now. I like it enough to keep reading. Scales of Justice by Ngaio Marsh. Audiobook. Lean Mean Thirteen by Janet Evanovich. Audiobook. Snappy dialogue, excellently presented by reader Lorelei King made me decide to re-listen to some of these. I listened to numbers nine, ten, and eleven a few weeks ago. Mr. Lazarus and Other Stories by Paul Dellinger. This collection spans stories dating from January 1962 to February 2013. The stories are fun, often drawing on the author’s fondness for old westerns and movie serials. His introduction, within which he comments from a very personal perspective on the evolution of short-form SF/F publishing over the past fifty years, is a gem. Don’t forget to check out the Wednesday Wanderings and Thursday Tangents! TT: Let’s Cut Down a Flagstaff! Looking for the Wednesday Wandering? This week I’m talking about the whys and wherefores of convention interactions. Then join me and Alan as we look at an event from New Zealand’s colonial past that would be funny if it wasn’t so intense. Oh! And tune in tomorrow for a new and possibly continuing feature — The Friday Fragments! JANE: So, last time Great Britain had founded another colony. I was a bit puzzled when you mentioned that the capital was at Russell. That doesn’t ring a bell. But then I remembered that the capital of the U.S. didn’t finalize for a while. Did the same happen there? ALAN: Yes, that’s exactly what happened. 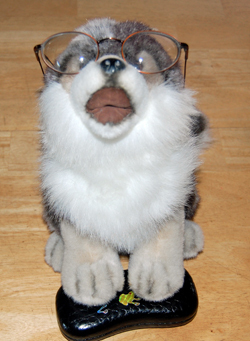 It soon became clear that Russell was a bit too isolated to be an administrative centre. It’s in the far north of the country and in those days it was accessible only by sea. Even today it’s a bit hard to get to, and the most direct route still involves a ferry trip. So the capital was transferred to Auckland which was a much larger settlement with much less restrictive geography. JANE: Wait! My atlas says that Wellington is the capital. It’s a relatively new atlas… Don’t tell me I need to pencil in corrections already! ALAN: No, your atlas is perfectly correct in what it says, so put your pencil down. In the 1860s, there were rumours that the South Island was considering declaring independence. Gold had been discovered there and the government was anxious not to lose the resource. The capital was transferred to Wellington, at the bottom of the North Island. Wellington is pretty much in the centre of the country and so it was a good place from which to supervise the administration of both islands. JANE: That makes sense, especially in the days before e-mail made location less important for such things. Did the tensions between the Maori and the colonists die down after the treaty was signed? JANE: Right! Last time you mentioned how the Maori had learned from past wars. How about a nice, juicy example? ALAN: OK – here’s something that almost has elements of farce about it. But it’s all perfectly true and is rather famous in New Zealand history. The Maori chief Hone Heke, one of the original signatories of the Treaty of Waitangi, gifted a flagstaff to the British. It was erected on Flagstaff Hill in Kororāreka. By 1844, Hone Heke was becoming disillusioned with the British and, in order to teach them a lesson, he set out to cut the flagstaff down. Following discussions with his friend, Archdeacon William Williams, he changed his mind. But another Maori chief called Te Haratua cut it down anyway. JANE: Better than cutting off a foot… So did this end it all? ALAN: Not at all. The British re-erected the flagstaff and, following further disagreements, Hone Heke himself cut the flagstaff down again on 10th January 1845. The British erected it again, sheathed it in iron to protect it from Maori axes, and built a guardpost around it. But on the 19th January, Hone Heke circumvented the defences and chopped it down for the third time. JANE: Either Maori axes were tougher than the British realized or they had some other trick up their sleeve. So did the British give up? ALAN: No, they didn’t. Feeling rather humiliated by the ease with which Hone Heke was running rings around them, the British hastily purchased a mizzenmast from a ship that was docked in the harbour and erected it as the fourth flagstaff. They guarded it with a rag-tag force made up of soldiers, Royal Marines, local colonists and sailors; about 400 people all together. In March 1845, Hone Heke attacked with about 600 well-armed tribesmen. The defenders were all killed and the flagstaff was cut down yet again. JANE: Good lord! What happened next? ALAN: Fighting continued on and off for many years. There’s a stunningly brilliant New Zealand film called Utu! which is set in these times. I recommend it highly. Anyway, by the 1860s, as part of the ongoing struggles between the settlers and the Maori, the government had implemented a policy of forcibly confiscating large tracts of land from the Maori as a “punishment” for earlier rebellions. But the Treaty of Waitangi gave Maori a powerful argument in the courts, and in recent years much land has been returned, untold millions of dollars of reparation has been paid, and the government has made multiple apologies to Maori for its historical crimes against them. I suspect that the Maori have been much more successful in resisting the oppressions of the colonial powers than any other indigenous people have been. They ran very successful military campaigns against the invaders, and later on they took to the courts to mount equally successful legal campaigns. They have always retained their cultural independence and sense of identity while at the same time assimilating themselves into the everyday life of the community. They have had, and they continue to have, a very important role to play in the governing of New Zealand. I really admire them for that. JANE: Me, too. The situation in what would become the United States was much more complex. The area was much larger and the indigenous peoples widely varied. 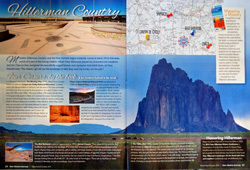 Even if we focus down to New Mexico, there are many tribes, each with their own story. However, there’s one event that many of these groups hold in common and that is memorable in the extreme: the Pueblo Revolt of 1680. ALAN: Actually, yes, I do. I’m finding this part of United States history extremely interesting because it’s all completely new to me. As I mentioned last week, Bubonicon (New Mexico’s SF convention) was held over the first weekend in August. I was a bit tired right after – not only was the convention a busy time, but we’d had to take one of our cats to the vet the night before the con started. (He’s okay.) This meant I started the weekend short of sleep. The panels I was on were fun and lively. Catching up with old friends is always fun and making new acquaintances who might turn into friends down the line is also fun. It was one of these latter encounters that got me thinking about the interaction between authors and fans. One of this year’s Bubonicon first-timers was a newly-published author named Livia Blackburne. Since she’d volunteered to help out with the Afternoon Tea on Sunday, I’d seen her name, but I didn’t know much more than that she had a YA novel published very recently. After my reading, I darted off so as not to miss the Opening Ceremonies. Imagine my surprise when a young woman I’d spoken with briefly out near Registration turned out to be Livia Blackburne. How could I have missed the connection? Why hadn’t I seen her name on her badge? Maybe she hadn’t registered then? At the end of Opening Ceremonies, I glanced over at Ms. Blackburne. No badge. That seemed strange. Then I realized she had it pinned to the hem of her top, so that it rested somewhere above her knee. Impulsively – I can be impulsive – I darted over to her. Already a little embarrassed by my forwardness, I quickly explained that she should wear her badge where people could easily read it. That had been a tough lesson for me to learn. 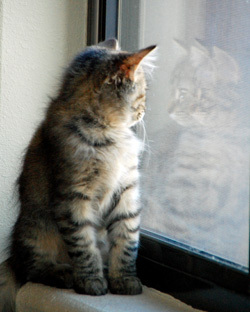 Although it may be hard for people who’ve seen me at conventions or book signings to realize, I’m naturally shy. The first couple of times I went to a convention, wearing a badge seemed almost cheeky. Why would anyone care? Wasn’t it enough that people be able to see it on me somewhere as proof I’d registered? Fact is, badges are incredibly useful – and not just for authors, but for fans as well. At conventions, you often encounter people you meet only once or twice a year. Badges provide a reminder of who is who. This really came home in 2013 when Bubonicon experimented with exchanging badges for wrist bands. The wrist bands provided proof of registration, but they didn’t provide names – and names are one of the best memory joggers. I’ve been at conventions where people not only write their names on the badges, but also the tag by which they’re commonly known on-line. Again, it’s a link. There’s a lovely lady who attends Bubonicon’s Afternoon Tea every year. I know her only as “Turtle Bear.” But that doesn’t matter. It’s a name she answers to… When I see the name Turtle Bear and all the associations flow back: our chat about her grandbaby, the hat she wore last year, and all the rest. Without the badge and the name, it might take me a little longer to pull up the right mental files. Don’t want to pin something to your shirt? That’s understandable. More and more conventions provide badge clips and/or lanyards. However, there’s a fun alternative. Bring your own! A few years ago, Jim and I picked up sparkly lanyards. Mine is varied shades of blue; his is black. A good quality lanyard can become an accent to your attire and also help eliminate the problem of your badge flipping over to show the wrong side. I noticed that by the second day of the convention, Ms. Blackburne had gotten a good quality lanyard and wore her badge without damaging her pretty tops. 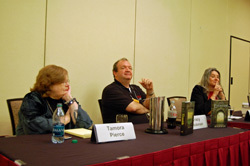 Another place that authors and fans interact is through panel discussions. Since I’m in giving advice mode, I’m going to offer a little regarding this as well. If you’re on a panel, for goodness sake, prepare in advance! Most conventions give you at least a week or two of warning. Some conventions (Bubonicon among them) supply sample questions. Think about the questions. Even better, think about interesting replies – something beyond the self-promotional “In my book I…” Reach for the roots of why you did this. It’s likely at least some of the audience knows what you did. However, until you tell them, they won’t know why. If you’ve been tapped to moderate a panel, your role is slightly different. I’ve been on panels where the moderator apparently thinks that this means he or she is the star of the panel and should keep the microphone as tightly held in his or her hand as possible. In fact, the moderator should try to speak last, if at all. The moderator’s job is to facilitate discussion, not to hog it. A moderator should prepare extra questions or consider a more interesting arrangement of those suggested. The moderator should try to keep the panel on topic. Many years ago, a long-time pro said wearily, “Every panel turns into the same panel.” I assure you, this is not the case when I moderate! Yes, it’s work, but that’s what you’re there for! Another thing a moderator should do is keep track of who is doing all the talking. Some panelists are naturally garrulous. Others are shy or diffident. The audience will notice if you let some panelists ride roughshod over others – and it won’t reflect well on you at all. You don’t need to push the shy ones to talk, but a polite, “Mr. Seagull, let’s give you first shot on this question,” will give quieter panelists a chance when the material is fresh. As for those of you in audience, burning up with what you’d like to say, remember – you’re not on the panel. If you have a question, write it down and save it for the end. If you have a statement you want to make, keep it short. If you have more than one question, ask only one, then give someone else a turn. Finally, when the panel is over, don’t rush the platform hoping to continue the discussion. The panelists need to move out to let the next event start. Wait until the panelists have moved into the hallway before buttonholing someone. Be sure to check if this person has time to talk. He or she may have another commitment not listed in the program book. Whew… I’ve gotten a bit carried away, so I’ll stop there… Thoughts? Questions? Looking for the Wednesday Wandering? Page back one for more about how conflict can drive – or fail to drive – a story. Then join me and Alan as we look at a very complex form of conflict – the interactions of cultures known as colonization. ALAN: Last week, we were talking about the arrival of the Spanish in New Mexico and how they took advantage of what they found there. So don’t leave me hanging in suspense. What happened next? JANE: Well, by this stage of Spanish exploration, most of the would-be colonizers were not interested in founding colonies. They were interested in finding heaps of treasure, stealing it from its owners, shipping it back to Europe (to contribute to the crash of the European economies that was already on-going because of too much New World gold), and settling down to a life of dissipation. One example is the area where the associated villages the Spanish would called San Gabriel and San Juan were located. The Spanish, under command of Juan de Oñate, came up and took over San Gabriel. The locals, with great good sense, moved to San Juan. According to their mandate from the Spanish crown, the colonists were supposed to build a church, start farming, and otherwise behave in a responsible fashion. What they actually did was subside into near banditry, because it was more fun to scatter all over the landscape searching for gold and robbing the locals when food was short. Later, some of the locals were legally enslaved by Oñate and his men – the Spanish often used “rebellion” or suchlike as an excuse to “arrest” and enslave locals – and transported to Mexico to mine silver. ALAN: That seems a highly dubious practice to me. It sounds as if Oñate was taking the law into his own hands and thoroughly abusing it. Did the Spanish crown do anything about it? JANE: To the credit of the Spanish government, yes, they did. A major investigation was undertaken. Oñate was tried and convicted. Part of his sentence was having his governorship stripped from him and his being forbidden to ever return to New Mexico. This was a huge slam to his ego. To this day, Oñate is not popular with many New Mexicans. His undoubted place in history as the leader of what is termed the second “entrada” is tarnished by the actions of himself and his men. Would you like to hear one of the uglier tales associated with Oñate? ALAN: Yes, please – this stuff is fascinating. JANE: There are various versions as to how the conflict began, but suffice to say that some Spaniards came to the pueblo of Acoma (see my WW for 10-27-10, for a bit more about Acoma), behaved in a manner that caused the locals to take affront, and a fight broke out. Several of the Spanish were killed. Oñate decided that this constituted rebellion, brought in a force, and attacked. 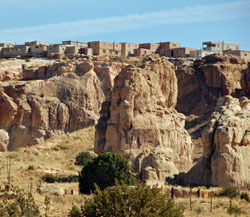 Acoma is a natural fortress, but the Spanish were very determined. They also had guns. In the end, the Spanish won and took these “rebels” as slaves. Please remember, the residents of Acoma had never agreed to Spanish governance nor had they been conquered. One historical account reports that when the Spanish first came to Acoma, they brought with them a local “translator” who did not speak the language spoken in Acoma. (There were at least five distinct languages spoken in the region.) Through this “translator,” the Spanish asserted their authority according to Spanish law and so they felt the village belonged to them. ALAN: It’s interesting that the region had so many different languages. The Maori language was (largely) the same throughout New Zealand which made contact between the newcomers and the indigenes reasonably straightforward. In Australia, by contrast, every tribe spoke a different language and even closely neighbouring tribes were unable to understand each other. That fragmentation proved to be their undoing when the conquerors arrived. Not content with enslaving these “rebels,” Oñate ordered that each man have one foot cut off. The men were then shipped to Mexico to mine silver. There are those who protest that this could not have happened – otherwise the historical record would have been full of accounts of Indians with one foot. Others protest that Oñate would not have reduced the value of his new slaves by mutilation. The truth hardly matters any longer, because the tale has entered local legend lore. A few years ago, it had an interesting sequel. You guessed it. They chopped off the statue’s foot. I’m not certain if it was ever repaired. ALAN: What a lovely end to a nasty story! But, before I went off on a tangent, we began by talking about the colonization of New Zealand. As I recall, we had just left the dissipated, hell-hole whaling village of Kororāreka. It sounds as if the Maori and the whalers were getting along quite well. What happened next? Did the good relationship continue? ALAN: Well, it did and it didn’t. The Maori had always been a warlike people and inter-tribal fights were common. They also had a lot of squabbles with the intruding settlers who were taking away their land. Once they began trading, and got their hands on modern weapons, these conflicts escalated. Many thousands of Maori were killed in the so-called Musket Wars of the early years of the nineteenth century. One important side-effect of this was that the Maori quickly developed offensive and defensive strategies that stood them in very good stead when they fought against the well-trained and well-armed British army in later years. JANE: So, how did matters get resolved? ALAN: Towards the end of the eighteenth century, Australia got in on the act when the Governor of New South Wales claimed New Zealand. He appointed a British Resident in 1832 to try and mediate between the Maori and the increasingly unruly settlers. The Resident attempted to build a formal confederation with the Northern Maori tribes. However the French (always Britain’s traditional enemy) also began making treaty noises. To forestall any French claim, the tribes were persuaded to send a declaration of independence to the then British King, William IV. This was only dubiously legal at best and ongoing unrest prompted the Colonial Office to send Sir James Hobson to claim full sovereignty for the British crown – which by then had passed from William to Queen Victoria, or Wikitoria, as the Maori referred to her. JANE: Ouch! Alan, you really should be careful. One day someone is going to take you seriously and you’ll get into a lot of trouble! ALAN: But to be serious for a moment, the Maori did adopt many English names for themselves and sometimes they adapted the pronunciation to slide more easily over their tongues. We’ve already seen Wikitoria, but another favourite is Wiremu, which is the Maori pronunciation of the English name “William.” It’s a very common Maori name these days – Robin has a Maori nephew called Wiremu. JANE: I like it. Names do become adapted to different languages. If I were Spanish, I would be Juana (“Wah-na”). It’s nice that the Maori contributed to the variations on William – which, in Spanish, is “Guillermo.” The double “l” is pronounced more like a “y” so a rough pronunciation is “Gee-er-mo.” “Wiremu” is at least as recognizable. ALAN: Anyway, Sir James Hobson negotiated a binding and comprehensive treaty with the various Maori tribes. It is known as the Treaty of Waitangi after the place where the tribes gathered to sign it, just outside Kororāreka, on 6th February 1840. With this, New Zealand became the latest and the last British Colony. The old hell-hole of Kororāreka (now renamed Russell) became the capital of the new nation, and Great Britain had one more country with whom to play cricket. JANE: I remember you telling me about the Treaty of Waitangi back when we were discussing holidays. The signing was a really important event, wasn’t it? ALAN: Very important. We regard the Treaty of Waitangi in the same way that you regard the Declaration of Independence, and for much the same reason. It marks the formal beginning of the country of New Zealand. JANE: So we’ve traveled across time from an isolated land discovered by a Dutchman who thought he’d found South America to the foundation of the last British Colony. However, if the Maori were anything like the American Indians (or Native Americans) the story is far from over. I’d like to pick up with it next time.